V.I.N.CENT the robot prop from 1979’s Black Hole « Adafruit Industries – Makers, hackers, artists, designers and engineers! V.I.N.CENT the robot prop from 1979’s Black Hole via BB. Full-size, screen-used V.I.N.CENT the robot hero from The Black Hole. 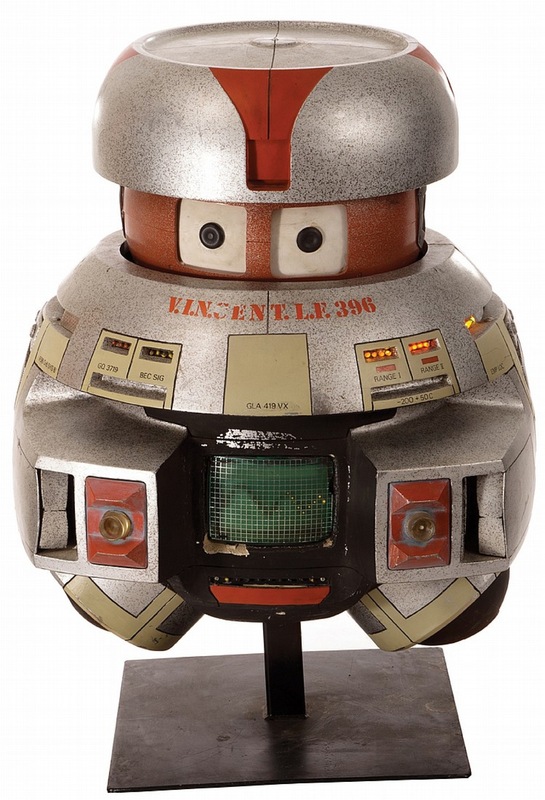 (Disney, 1979) This is the hero “working” V.I.N.CENT (Vital Information Necessary CENTralized) robot who was the main protagonist in Disney’s 1979 science fiction epic The Black Hole. Voiced by actor Roddy McDowell, the optimistic robot is essentially a fusion between R2-D2 and C-3PO in the Star Wars universe. Very “intelligent” it is able to accomplish a wide variety of tasks, and its means of locomotion is hovering. Measuring 35.5 in. tall (on metal stand) x 26 in. diameter, its outer surface is created of fiberglass with metal and plastic internal components consisting of electric motor with chain drive to turn V.I.N.CENT’s “head”. The robot is fully functional with outer incandescent color lights, green sequential “wave light” on the chest and head movement (both clockwise and counter-clockwise) being operated with the provided control panel fitted with toggle switches. Power is provided by a 6-volt motorcycle battery. Exhibits minor cracks and scuffs in areas from production, and some of the perimeter lights are nonoperational (the vast majority work) and can be easily repaired. This amazing robot character was acquired 20 years ago directly from Disney and comes with a signed letter of authenticity from the Walt Disney World Company on Disney/MGM letterhead stationery. One of V.I.N.CENT’s most memorable quotes: “There are three basic types, Mr. Pizer: the Wills, the Won’ts and the Can’ts. The Wills accomplish everything, the Won’ts oppose everything, and the Can’ts won’t try anything.” A rare and highly desirable science fiction artifact with full documentation. The Black Hole received an Academy Award-nomination for Best Visual Effects. Special shipping arrangements will apply. I still remember this robot from Star Wars with the voice of Roddy McDowell. We thought robots were impossible and a fantasy back then. Now they are performing human jobs and becoming a very real part of our daily lives.